If you've ever looked out the window at an airport, you've probably seen planes being pushed backward by vehicles called Pushback Tugs. Well there are regular Tugs, and there are SuperTugs — and the SuperTug looks like the unholy matrimony of a Hummer and a Batmobile, with an ant's strength/weight ratio. The common pushback comes in various shapes and sizes, and either runs off battery-supplied electricity, or diesel fuel. Some are open-wheel, while others have enclosed cabs. Typically you'll see the enclosed ones in cold weather cities. Pushbacks all have the same basic functions. The driver sits behind a big steering wheel, while wearing a headset to communicate with the pilots. The headset can either be wireless, or connected directly into the communications box on the nose of the plane by a long tether. Like any car, there is a horn, lights, parking brake, gear shifter and even a turn signal. When the flight is ready to depart, the jetbridge is pulled back. After completing their pre-departure checklist, the pilots call the tower for clearance to push back away from the gate. The driver is responsible for communicating to the pilots that it's safe for the plane to leave, and will say something like this: "The walk-around is complete, the bypass pin is in, the safety zone is clear, and all cargo bin doors and access panels are closed. We'll be doing a 2-person push." The 2-person push means the pilot needs to check for two people when the push is complete. In addition to the pushback driver, there is a wing walker, who provides an extra set of eyes to the pushback driver, making sure there are no vehicles, people or obstacles behind the aircraft. This can vary somewhat, based on the airline procedures, and the aircraft type. At that point the pilot says, "Brakes released, clear to push" which the driver will acknowledge, and depending again on the airline policy and the airport configuration, the driver may give the okay to start the plane's engines. Because some airport terminals are so densely populated by gates, sometimes planes are towed a good distance from the gate and out to a taxiway before the engines are spooled up. Driving the pushback itself is pretty intimidating the first few times you do it. You're sitting there in this tractor-on-steroids, dwarfed by a massive jet that likely cost anywhere from $40-320 million. But the overall concept is pretty simple when driving a pushback with a towbar. The direction you turn your steering wheel will turn the tail of the plane in the same direction. I've pushed hundreds of planes, and it's kind of a fun power trip, because even though the pilots might make 4 times what I do, they're still at my mercy for those few minutes. There is one major difference between a pushback and a SuperTug (also known as a high-speed tug). While the regular pushback attaches to the plane's nose gear via a tow bar, while the SuperTug actually pulls up to the nose gear, wraps itself around the gear and lifts the nose of the plane off the ground (see the video above). I've never driven a SuperTug, but their strength and speed has always impressed me. SuperTugs are used for a couple of purposes. They push the biggest planes, like the 747 or A380 away from the gate. Or they can be used to tow planes for longer distances. For example, at some of the big international airports, airlines share gates. 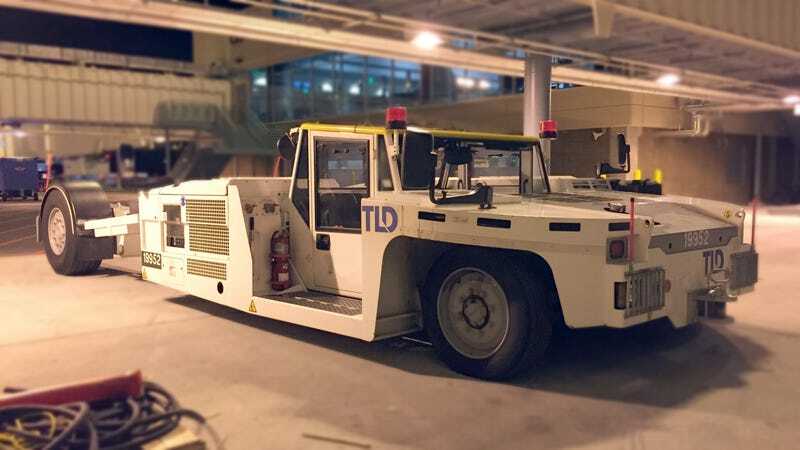 If an international airline has a 8:00AM arrival but doesn't leave until 6:00PM, that plane might be towed by a SuperTug off to a remote parking spot called a stand, so that the gate can be used for other arrivals and departures during that time. Next time you're at the airport, pay a little closer attention to the vehicles you see driving around. Airlines hang onto vehicles (and planes) for a very long time, and you could easily see some trucks and vans from the 1970s. If the airport is a big hub for the airline, a special crew of Ground Service Equipment (GSE) mechanics keep these things up and running, while saving money for airlines. If you ask someone within the airlines why they hang on to planes and vehicles for so long, the answer is simple: "They're paid for." All photos are by the author, Paul Thompson, unless otherwise noted.